As I've mentioned, we have several house guests coming to visit over the Summer - the perfect excuse to refresh our guest bedroom. As guests rooms seem to do, ours had filled itself with the 'extra' stuff that we didn't have a place for anywhere else it the house. I had put some old bedding on the bed, without much consideration how it would go with the wall color, and the furniture consisted of a black desk and chair, and an old table that used to fit in our living room. I felt like the room was too dark and heavy. I wanted the room to feel like the room from our hotel in East Hampton - light and fresh. I painted almost everything in the room white, except for the black iron bed and drapery rods. I think that too much white can seem blah. The black contrasts with the white and actually makes the room feel brighter. For bedding, I like to keep the palate bright and white. Two large down euro pills, two standard pillows and one accent blue pillow with a hemp trim. I always use all white sheets and pillow cases (and towels!). Colored linens just don't feel as fresh to me. I dress the bed with a lightweight duvet in a white cover, then I put a heavier down comforter folded at the foot of the bed in case they get cold. I painted this once black desk a fresh creamy white. I thought I was over my all white furniture phase from the shabby chic trends of 2000, but it was the only thing to do on a shoe-string budget to makeover the room and make it feel fresh. The room completely changed when I added the white upholstered chair from our old dining room. It filled it and made it feel cozy almost instantly. I got out my light grey/almond spray paint and gave this once black painted chair a new look and a stack of fresh towels. The bedside table (also painted a creamy white) has a photo of Peaches, a handmade bowl we received for a wedding gift from Mike's parents, a framed sketch of Seaside where we got married, my gold engraved confirmation Bible and some hydrangeas from our yard. You might recognize the lamp - it was once brass in our old bedroom. 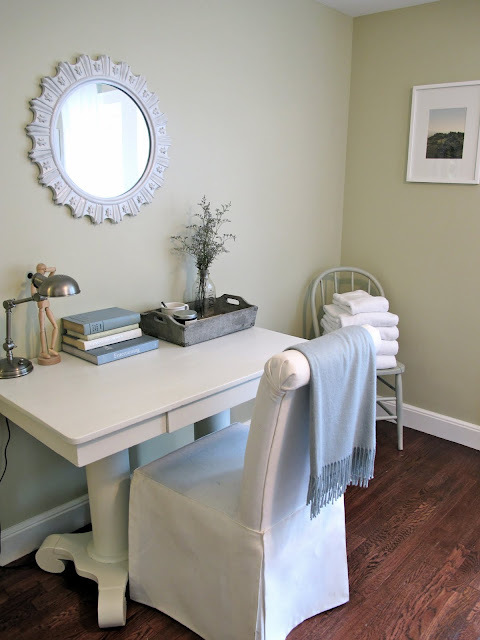 I used the same paint as the chair - they sit in opposite corners of the room... talk about balance! Looks so fresh and stylish! You do such a nice job painting everything..is it easy to sprat paint brass lamps? I would be afraid of drips. Room looks fantastic. So clean and fresh. I'm loving the grey color of the chair and lamp. Will you share what color that is, please? Cindy - the paint worked great on the lamp. I use long, sweeping spray strokes that allows the paint to go on in thin coats. Brook - I believe the paint is Almond... but I need to look to be sure! I'll get back to you! Kiswenson - Thanks! It is a slow, but steady process. The next one I'll share is my "domestic office"... or where I keep my cooking gear that doesn't fit in the kitchen, cleaning supplies, crafting supplies and ironing board. Stay tuned! Ok, thanks, I'll keep checking back. Is it Rustoleum brand? Jenny- do you mind sharing where the striped duvet cover is from? I love it. Shauna - The duvet is from Pottery Barn. I got it a couple of years ago, but I think they still have it! Hi Jenny What is the color for the guest bedroom walls it's so beautiful? Hi! Just wondering where you found the fabulous iron bed? Love its simplicity and elegance with its rounded headboard and straight footboard. Buffie - I made the slipcover and covered a random chair I found at a discount store! I too would like to know the name and brand of this wall color, please!!! Looking for a soothing color with light green undertone, I love the way this one looks.